The Great Lakes have seen over 180 non-native species introduced since the establishment of closer monitoring procedures. Asian carp are the latest and possibly the most threatening species to the Great Lakes ecosystem. What makes the potential Asian carp invasion different and a cause for concern? How susceptible are the Great Lakes to an Asian carp invasion and what could happen if such an invasion were to take place? Figure 1. The five bodies of water that make up The Great Lakes is the largest source of accessible freshwater in the world. Courtesy of NASA, 2000. Public Domain. Currently, two of the five species collectively known as Asian carp, bighead (Hypophthalmichthys nobilis) and silver carp (Hypophthalmichthys molitrix), are causing a great concern for the Great Lakes Basin (Figure 1 and 2). These fish were first brought to the United States in the 1970s as a means to improve the water quality of aquaculture facilities. Flooding allowed the carp to escape into the Mississippi River Basin and quickly spread upstream. Asian carp are now established and thriving throughout the Upper Mississippi River System (Figure 2). Figure 2. A school of invasive Asian Carp in Chicago, Illinois. Photograph by Kate Gardiner, 2009. CC BY-NC 2.0. Asian carp present a threat to existing ecosystems in the United States because of their fast growth rate, ability to reproduce multiple times per year, adaptability, and their ability to dominate an ecosystem. In some parts of the Illinois River, Asian carp account for nearly 90% of animal life.2 Asian carp can weigh as much as 100 pounds, although they commonly weigh between 20 – 40 pounds. At such a size, there are no North American fish that are able to prey upon adult carp.3,4 There are only a few predators that are able to prey upon young Asian carp because the carp grow very fast and the window of opportunity is narrow, making natural methods of population control difficult.3,4 Asian carp are constant and voracious eaters, able to consume between 20-120% of their body mass in plankton. The insatiable appetite of Asian carp could lead to a plankton shortage for native fish that eat plankton as they grow, and those that consume it throughout their lives. Bighead and silver carp in Illinois rivers are believed to be the cause of the reduced fitness of at least two native planktivorous fish.5 In less productive ecosystems, such as Lake Michigan, the effect could be far more devastating as Asian carp could negatively affect the condition of native or commercially desirable species. This could lead to lower quality and reduction in the number of eggs, as well as an increased susceptibility to disease among native fish.2,5 Silver carp also pose a direct physical threat to humans. The species has a tendency to leap high out of the water when disturbed by noise, such as the sound of a boat engine. This can lead to injury and property damage. Thus, silver carp are a threat to the prevalent recreational boating culture of the Great Lakes (Figure 3). Figure 3. Asian Carp jump out of the water when disturbed by the sound of a boat engine. An important part of preventing the spread of Asian carp is predicting where they may be able to establish a population. This is rather difficult as Asian carp are a very adaptable species. In their native Asian environment, Asian carp inhabit a broad range of climactic conditions which are similar to many areas of the United States and southern Canada.6 There are twenty-two known tributaries in the Great Lakes Basin that match the criteria of an ideal spawning ground for Asian carp based on length, temperature, current velocity, and water quality of the tributary.7 In 2012, four grass carp were caught in Ohio’s Sandusky River. These fish possessed traits indicating that they lived their entire lives in this river.8 While grass carp are not as great a concern as silver or bighead carp, they have similar spawning habits. The grass carp caught in the Sandusky River suggest to researchers that bighead and silver carp may be able to spawn in shorter rivers, and therefore more locations than previously expected. A recent report indicates that four tributaries of the Great Lakes Basin, the Sandusky, Maumee, Milwaukee, and St. Joseph rivers, could be suitable for Asian carp spawning.9 This same report suggests that Asian carp may be able to spawn in as little as 25 kilometers (16 miles) of un-dammed river, which is far less than the previous estimate of 100 kilometers (62 miles).9 Although the common understanding is that Asian carp eggs require a long stretch of unbroken river current to hatch, reports exist of silver and bighead carp spawning in stagnant water.9 These reports are few, but raise concerns that the carp may be able to spawn even further outside of predicted areas. Figure 4a. 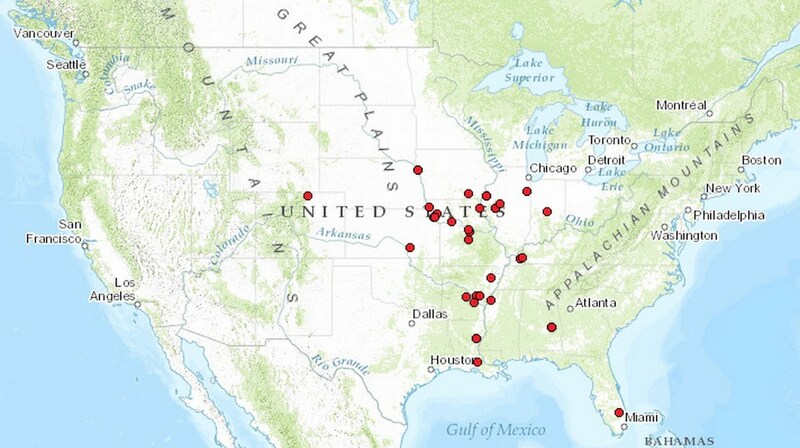 Reported Asian carp sighings as of 1980. Figure 4b. Reported Asian carp sighings as of 1990. Figure 4c. 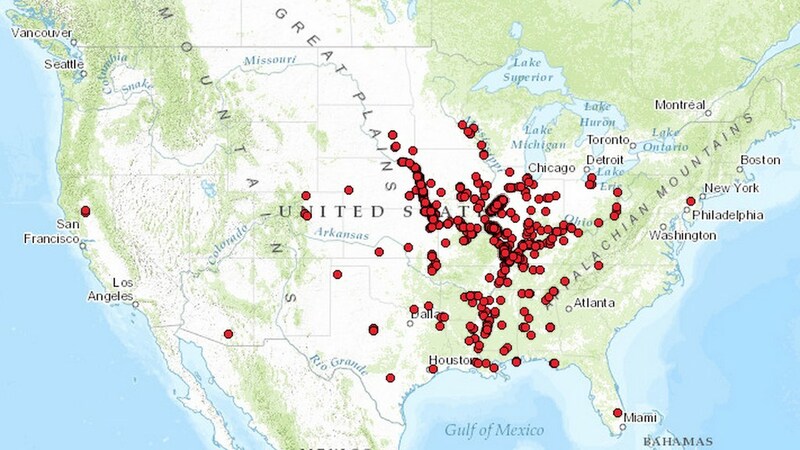 Reported Asian carp sighings as of 2000. Figure 4d. 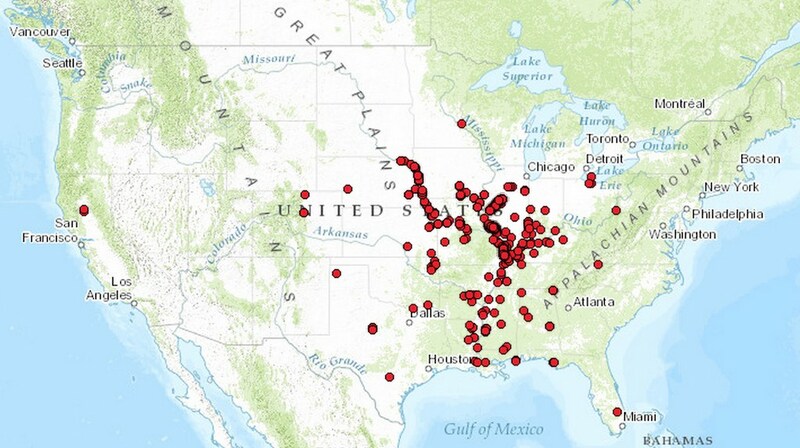 Reported Asian carp sighings as of 2010. Taking preventative measures will ultimately be far less costly than long-term attempts to manage the Asian carp invasion. However, to fully address the problem, scientists and governments will need utilize both measures to manage the carp.1 While preventative methods greatly reducing the risk of a sudden and full-fledged invasion, they are never guaranteed to work. Various governments and environmental groups are working to educate fishermen on the species, although it is nearly impossible to prevent accidental introduction through the use of live baitfish. One method of preventative measures to control Asian carp is the use of an electric fish barrier in the man-made Chicago Sanitary and Ship Canal. This canal is the best direct connection between the Mississippi River and the Great Lakes Basin and also the most likely site of Asian carp introduction. The electric fish barrier placed in the canal has proved to be largely effective, though it could potentially be bypassed during ship crossings, floods, equipment malfunctions, or repair efforts.7 Despite these and other measures, positive eDNA detections for both silver and bighead carp have been found upstream of the electric barrier near Lake Michigan. There have been a relatively small number of detections and the uncertainty surrounding eDNA testing suggests that while a few Asian carp may be present, a successful and reproductive population has yet to be established. eDNA detectors search for genetic material and cannot prove that the source is a live fish. In anticipation of an imminent Asian carp invasion, officials are considering closing the entire Chicago Sanitary and Ship Canal. This is a more permanent and costly solution. Although the Chicago Sanitary and Ship Canal is the most likely route for Asian carp to reach the Great Lakes Basin, many possible introduction sites remain. It is difficult to know exactly how and to what extent an Asian carp invasion will disrupt existing ecosystems. Based on reports of past invasions, as well as predictions for the Great Lakes, it is clear that there will be a great impact. The three most important factors surrounding this potential Asian carp invasion are the likelihood of introduction, ability to establish a population, and ability to spread. Steps can be taken to prevent the introduction of non-native species. The focus remains on Lake Erie and Lake Michigan as they are the most likely sites of introduction due to their proximity to the established populations of Asian carp. However, a large interconnected system such as the Great Lakes Basin, coupled with human activity in the region makes prevention difficult. Once the Asian carp are introduced, their reproductive adaptability, wide climactic range, and the availability of food and habitat suggest that they will be able to establish in any number of areas throughout the Great Lakes. When established, their voracious appetite, fast growth rate, and reproductive capabilities will allow them to spread throughout the Great Lakes. All lake and river systems will require consistent monitoring to prevent the carp from establishing in the region. With such a high likelihood of infiltration and a $7 billion fishing industry at stake, conducting wildlife and resource management for the Great Lakes Basin will need greater and more permanent solutions to address the Asian carp problem. Zander, M. et al. (2010). Journal of Great Lakes Research. 36: 199-205. Irons, K. S. et al. (2007). Journal of Fish Biology. 71 (Supplement D): 258-273. Rasmussen, J. et al. (2011). Journal of Great Lakes Research. 37: 588-592. NASA. (2000). Satellite image of the Great Lakes from space. [Photograph]. Retrieved from Wikimedia Commons. Public Domain. Gardiner, Kate. (2009). 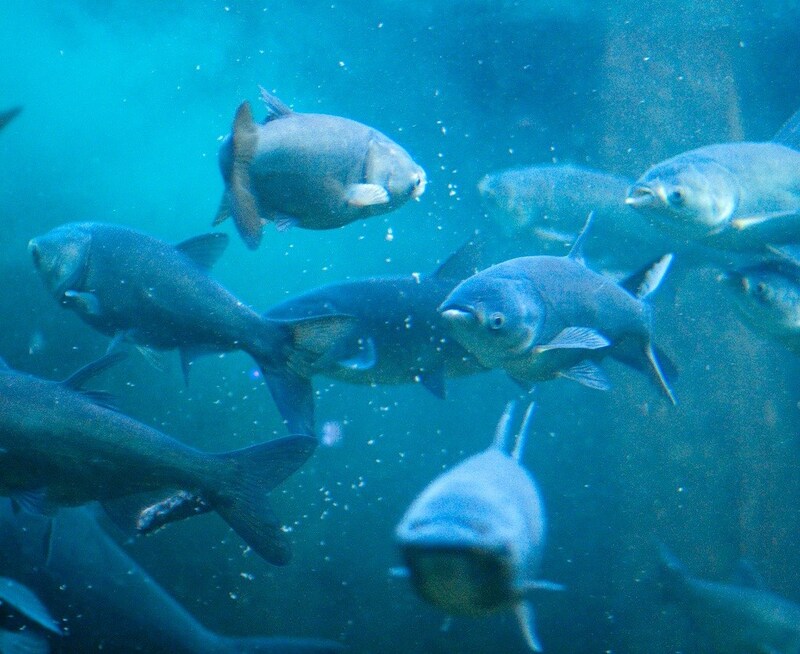 Asian Carp – Shedd Aquarium. [Photograph]. Retrieved from FlickrCommons. CC BY-NC 2.0. U.S. Geological Survey. Nonindigenous Aquatic Species Database. Accessed March 2015. 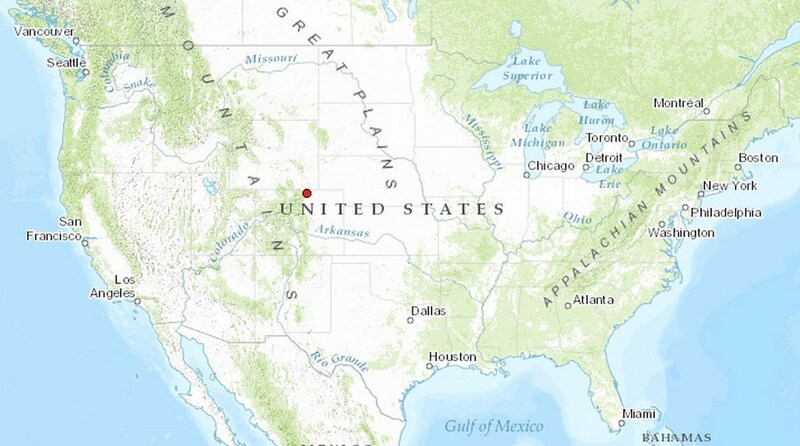 Retrieved from http://nas.er.usgs.gov//queries/SpeciesAnimatedMap.aspx?speciesID=551. Public Domain.